Car Suspension - Orinda Motors Inc.
“Impressive work on my 1966 Pontiac as well as our daily drivers. Very happy to find a competent/professional/reliable shop.” -- Scott B. The suspension system absorbs shock and vibration from the road so your body doesn’t have to. Car suspension also plays a critical safety role by working to continuously keep all four tires on the ground for maximum traction, braking, and steering capability. In a car with independent suspension, each individual wheel moves up or down independently without affecting other wheels. There are two main independent suspension designs: Double Arm and McPherson Strut. Both double-arm and the McPherson suspensions use sway bars to transfer movement from one side of the car to the other to prevent it from flipping over in a turn. The second design, a live (solid) axle, moves up and down like a seesaw, affecting the height of the wheel on the opposite side. Although less adept at maintaining traction, this type of suspension is stronger and more common on rear axles, and is especially common on trucks. 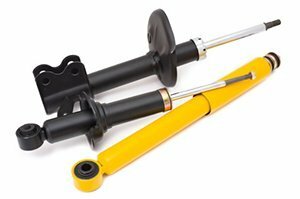 Live axle designs commonly use leaf springs rather than coil springs, shocks, or struts. Although this arrangement doesn’t effectively provide a comfortable ride, it better distributes loads evenly, which is why this type of suspension is generally found on trucks and larger vehicles. Our Orinda Village location has a comfortable waiting area and is located near several stores and restaurants, Safeway, Starbucks and the Orinda Library, so you can go explore the area or catch up on work while you wait for your auto suspension system service to be complete. If you choose not to wait for the completion of the suspension system service, we offer a free shuttle to BART, home or work. We also offer pickup and delivery of your vehicle for no extra charge! If you need a car we also have Orinda Auto Rental located on the premises. If your car suspension system needs attention, we invite you to schedule an appointment, call us, or stop by our auto repair facility at 63 Orinda Way, Orinda, CA 94563.